maribo: Did climate scientists make a mistake in predicting the decline of Arctic sea ice? Did climate scientists make a mistake in predicting the decline of Arctic sea ice? Each spring, the ice on the lake near the family cottage meets its demise. As the days lengthen and warm, the ice gets thinner and thinner. No one ventures onto the lake for fear of breaking through. One sunny day, usually in early April, the ice disappears. This death spiral of lake ice each spring is familiar to people across Canada and the northern United States. From above, the lakes look completely frozen during most of the melt process. The real sign of ice melt is the rapid drop in thickness or volume. Thanks to climate change, the Arctic sea ice is in the throes of its own death spiral. 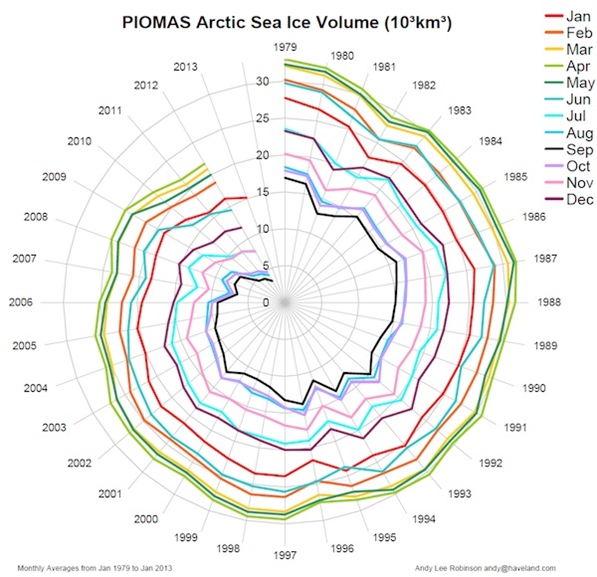 The volume of sea ice in the Arctic, the key measure of ice change, has been declining rapidly for decades. There is now roughly 75% less summer ice in the Arctic than three decades ago. Yet you don't hear about the volume of ice in the news. Journalists, activists and scientists normally highlight the very visible decline in area of ice during the summer. There's a valid argument for talking on the more immediately relevant area of ice. Last September, area of ice cover dropped to only 3.4 million km2, less than half that in the 1980s. 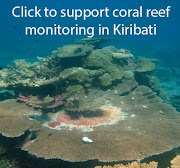 This dramatic melt was visible in satellite images. It was visible to the many boats transiting the once-forbidden Northwest Passage. As with our small lake, the area of ice is not the best measure of the ice pack. Last summer's open water froze over the winter, forming a layer of ice thinner than what you'd find on our small lake during the height of winter. Due to natural variability in the weather, much of that thin Arctic ice survived the summer. Though the area of ice is still far lower than that of decades past, it is roughly 30% greater than last year. This year's ice area has been manna for ardent climate change contrarians. Bold claims about the rebound of Arctic sea ice proving climate scientists wrong now abound on the internet. In some cases, the claims about data are technically correct. In all cases, they miss the big picture. The death spiral of Arctic ice continues. According to the Polar Science Center at the University of Washington, the volume of summer sea ice has declined by roughly 75% in the past few decades. 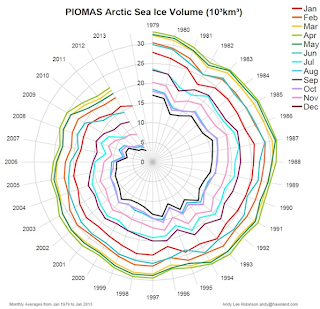 The monthly ice volume figure (right) from their Pan-Arctic Ice Ocean Modeling and Assimilation System (PIOMAS) actually looks like a spiral, with the ice volume for each month of the year declining over time. Scientists' only mistake was not talking more about ice thickness or volume. This long-term change in ice volume, rather than the annual summer ice area, is the best harbinger of the future. Those boasting about the Arctic "rebound" this year should heed caution. They are standing on very thin ice. Posted by Unknown at 1:42 a.m.
Simon, I normally greatly appreciate your postings for their great clarity and insight. In this case, however, I believe you have erred. Specifically, the graph of Arctic sea ice volume you show shows no data more recent than January, 2013. Looking at the Piomas homepage I see that there has been a significant increase in sea ice volume for the time of year relative to 2012. Further, the average sea ice thickness closely approximates to that of 2012, so therefore the percentage increase in sea ice volume must also approximate to the percentage increase in sea ice area. Therefore the primary premise of your argument in not sustained by the data. In fact, I do not think there is any mystery in the current rebound in Arctic sea ice volume and area. As the mean September sea ice shrinks, seasonal variation represents a greater percentage change in the remaining ice. That is why the breathless commentary in some pro-science blogs last year was out of place, just as the breathless commentary in denier blogs this year is out of place. The sea ice extent still tracks within error of Tamino's death spiral predictions (made last november), so talk of a recovery out of place. Fair enough. My point is less about this year - that's just an example - than about the volume or thickness being a better indicator of the future than the area. But I get the criticism of the argument when applied specifically to this year. Here's the other way to think this post: ice area can change a lot faster than ice volume, so it is more responsive to year-to-year and month-to-month fluctuations in the weather. As a consequence, the decline in volume since 1979 is steadier than the decline in minimum ice area, as is the case on a small melting lake. As such, data on the change in the volume over a bunch of years (for the Arctic) or a bunch of weeks (for a small lake) is more useful for predicting the future than data on the change in ice extent.